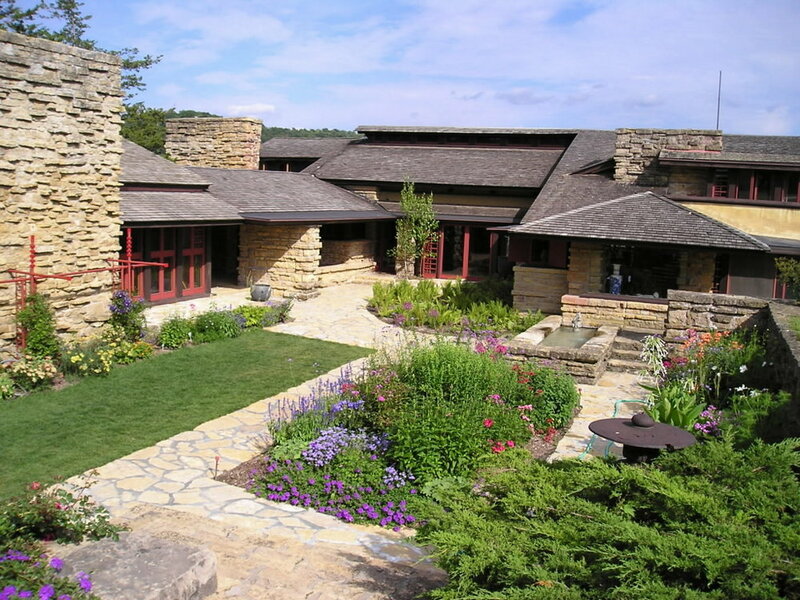 Which Architectural Home Style is Best for You? We've been writing this month about the health and happiness benefits that come from choosing a home with some degree of outdoor living space, so we've selected Luna Lake as September's Featured Plan of the Month! Please enjoy this Mini Study Set, yours free to download for this month only. Luna Lake is a true high-roller estate, enveloping your family in comfort and luxury, and entertaining your guests with flash and substance. Luna Lake would be right at home in the Sun Belt, with its beautiful Spanish architectural style and glamorous outdoor living space, including a large covered patio for entertaining with evening cocktails, and a crystal clear pool for cooling off from the desert heat. A courtyard, simply stated, is a fully or partially enclosed area that is open to the sky. Courtyards have a long architectural history, with examples found as far back as 6400 BCE in the Jordan Valley, and the reasons for their enduring appeal are obvious. Courtyard homes satisfy the human needs for security and retreat while bringing the restorative power of nature to your daily life in a soothing, intimate manner. Dating back many thousands of years, the original purpose for courtyards seems to be as a cooking area, allowing for both privacy through containment behind walls and for smoke to escape from cooking over open flame. As is still true today with modern kitchens, this made the cooking area a gathering space for friends and family from the very beginning. By the time of the ancient Romans, courtyards were often used to entertain, still through shared meals, but now with hosted parties and traveling musicians. This ultimately led to the notion of what we think of as a royal “court” a term that takes its most basic meaning from the trusted friends and allies who would gather in a royal courtyard. The sprawling, sumptuous courtyards of royalty and the elite are bound to impress any visitor, but courtyards can provide just as much peace and calm on a much smaller, more personal scale when designed as a central feature of your home. 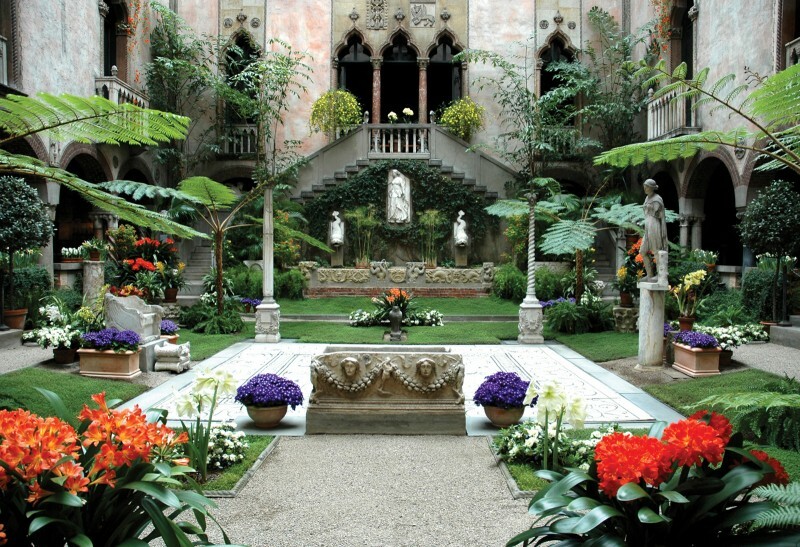 The Courtyard of Boston's Isabella Stewart Gardner Museum is the heart and soul of the museum, showing off everything Isabella loved most and conveying her aesthetic in a harmonious, light-filled space. It is at the center of the museum, visible from nearly every gallery space, and features an ancient Roman sculpture garden, a medieval European cloister, and a Renaissance Venetian canal-scape along with a stunning garden filled with flowers that change to reflect the season. Courtyards are a lovely way to bring a shared sense of serenity to your home, particularly because the walls and windows of many rooms form its enclosure. That means, for example, that you will be able to enjoy your sun filled sanctuary as a view from your office, your bedroom, and your family room, allowing you to enjoy nature and the changing seasons in your daily life. Courtyards are a particularly common feature in Italian, Spanish, French, and Moroccan style homes, given the fact that outdoor living spaces have always been prevalent in temperate climates like the Mediterranean region, but they are just as lovely in more wintry environments as well. There are few things in life more serene than snow falling gently on an enclosed Zen garden. Truly, the beautiful thing about courtyards and all outdoor living spaces is how they can be customized to your preferred style and scale. To see what this looks like on a floor plan, check out our petite Douglas Fir, or take a look at Cottonwood Lake’s contemporary ease. You may connect with the Tuscan warmth of Yampa River, Castle Lake’s French Country charm, or prefer the larger scale of Flint Lake with its dual courtyards. We’re in the process of updating our website right now and adding our full collection of plans, but you can still see our extensive offerings here or browse through the pages of The Complete Home Collection, available on Amazon. Here in the Rocky Mountains, we know how lucky we are to have 300 days of bright sunshine a year, but no matter where you reside, spending some time reconnecting with nature is proven to make you feel happier, healthier, and more creative. That’s why we wanted to take the final week in August to talk about how outdoor living space can enhance your home and your lifestyle. Outdoor living is an essential component to every Rocky Mountain Plan Company plan, and we’re always looking for clever ways to tuck in a courtyard, a private deck, or a firepit on our smaller plans, or add dramatic patios, covered decks, and even outdoor kitchens to our larger plans. A home with a strong indoor/outdoor connection feels larger and airier, allowing more natural light to filter through your space, but an added bonus is how well-designed outdoor living space allows you to dramatically expand your square footage for special events and parties, while keeping your indoor space tidy and perfectly sized for your daily life. Tomorrow, we’re going to talk in more detail about courtyards, including a bit of history and how many ways you can make your outdoor living space suit your preferred architectural style. See you then! When first getting into the realm of Home Energy Ratings, the lingo can be slightly confusing. HERS, the Home Energy Rating System is based on a home’s energy rating, which is an analysis of a home’s energy performance that includes energy modeling with accredited software. At Rocky Mountain Plan Company, we take into account what a HERS rating is going to be before we suggest building any of our homes. The HERS Rating is based on the HERS Index, the official number that comes from the rating. A home that just meets code has a HERS rating of 100. For every point above or below 100, the home is that many percentage points less or more efficient than the same home built to code. Lower numbers are better, they mean the house is more efficient. For example, a HERS Rating of 30 means that this home performs 70% better than the same home built just to code. A HERS Rating of 0 means it is a Net Zero Home which means it produces as much energy as it uses each year. How can you improve your HERS Rating? A HERS Rater can do a comprehensive rating on your home to assess its energy performance. There energy rating will consist of a series of diagnostic tests using specialized equipment, such as a blower door test, duct leakage tester, combustion analyzer, and infrared cameras. These tests will determine the amount and location of air leaks in the building envelope. the amount of leakage from HVAC distribution ducts, the effectiveness of insulation inside walls and ceilings, and any existing or potential combustion safety issues. Some other variables that are taken into account include floors over unconditioned spaces (like garages and cellars), attics, foundations, and crawlspaces, windows and doors, vents and ductwork, water heating system and thermostats. These tests will allow you to fix any problems that may be decreasing your HERS Rating. Using these tests will give insight into potential issues in your home. For more information on common issues during the building process, check out our other articles on Building Sciences. Once the test have been completed, a computerized simulation analysis using RESNET Accredited Rating Software will be used to calculate a rating score on the HERS Index. Whether building a new home, remodeling an old home, or if you are just curious about the rating and efficiency of your home, the HERS Index is one of the most widely known and used tests around. Please feel free to reach out to us if you have questions regarding HERS ratings and/or what that means in terms of our plans! You have probably seen similar pictures as the one shown on the right. The infrared exposure shows how energy is escaping from this wood frame house. Notice the primary areas where the plates and headers are typically located. You can see where the double top plates are just under the eave. You can also see the wood headers above each window. We will show you a suggested alternative to provide insulation in these areas so that energy is not lost. This approach is not the only way to make this home more energy efficient, but it will provide a very inexpensive way to improve the condition of the home’s insulation. Using a typical wall section, we will show the areas in detail so that you can see what alternative methods you can take to provide better insulation. The design team at Rocky Mountain Plan Company believes that it is important for residential designers to take the lead in high performing homes to help our country become better at saving energy. Techniques to save energy help everyone. Home owners can save on utilities, and the United States can become a better world leader in energy savings. Better insulation is one of several small steps to a much better home design. The responsibility of all residential designers should be to provide solutions for the environment, and not to contribute to the source of the world’s energy problem. The image on the right (Plate 002) is an enlarged scale of the roof soffit. The top detail shows how we have been insulating at this condition for years. Below is a simple solution that allows the insulation to carry over into the soffit area. Notice the gap just under the sheathing. The insulation must be such that the attic area can still maintain ventilation. Window and Door headers are critical areas for energy loss, but usually get missed. Many times designers hand off residential plans to engineers to size these headers. Unless the engineer consults with the designer on the sizes indicated, the engineer usually specifies solid members. We recommend that the designer and the engineer collaborate on the suggested insulated headers. 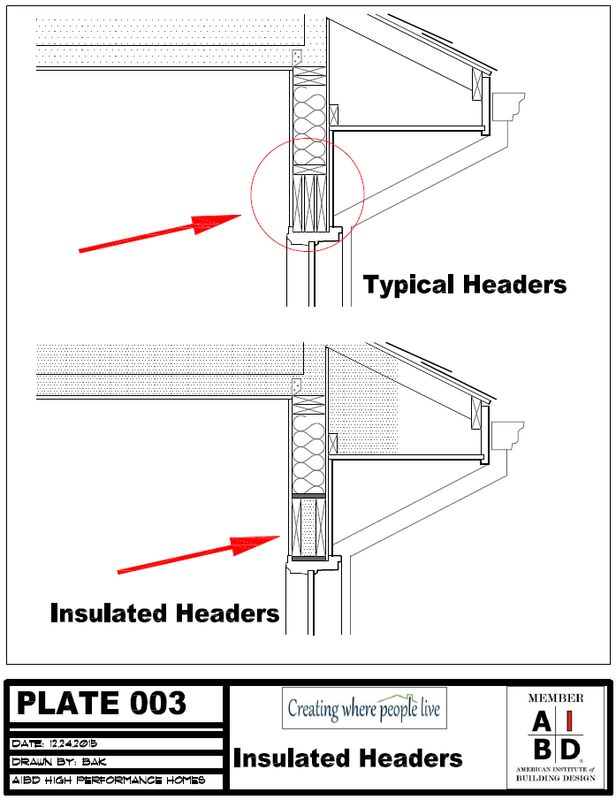 Most designers understand insulated headers as providing two framing members so that the builder can fill the space between the members with insulation. Providing ¾” laminated tops and bottoms to the headers allows framers to have the headers pre-made and ready to set into the framing wall. But most importantly, the area is insulated and can help prevent excessive energy loss. See Plate 003. On Plate 004 we show Rim boards that occur at the bearing of floor joists just on the outside of the exterior walls. It is a perfectly easy place to provide good insulation. Along with the insulation that is commonly placed between the floor joists, additional Styrofoam sheets can be placed just on the inside face of the rim board. And in conditions where the floor joist bears on a foundation wall, a Styrofoam sheet can be placed atop the foundation wall next to the wet plate to address a common area where heat escapes a building, particularly on basement foundation systems. What you have learned? In this post, you have learned how to improve the performance of your home by using effective insulation techniques. By properly insulating your attic, window and door headers, floors, and foundation, you can reap the savings of your comfortable and efficient higher performance home.